South Africa – Two people died following an accident caused by heavy storms in Johannesburg, the City’s emergency services said on Sunday. 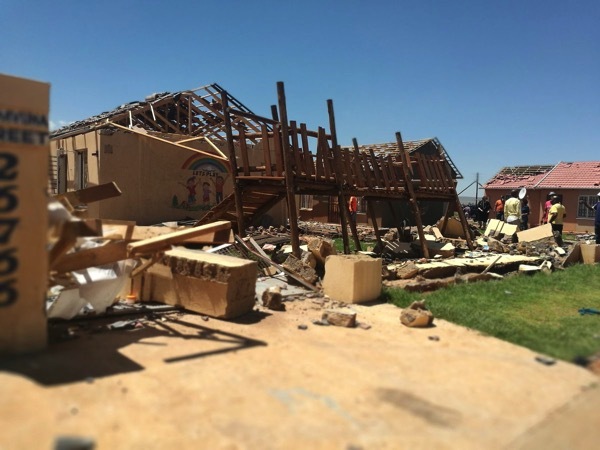 Between 30 and 40 houses in the Protea Glen and Braam Fisher areas in Soweto were found to have suffered damages from the storms which included a severe hailstorm. Parts of a roof collapsed at the Trade Route Mall. Trinidad & Tobago – Incessant rainfall this week has led to widespread flooding and a massive landslide. Trinidad and Tobago’s Meteorological Services has warned of increased fluvial flooding due to high rainfall. Areas of northern Trinidad have been affected by power failures and a major landslide that blocked the North Coast Road. A prohibition notice has been issued to an abattoir in the Tshwane area halting it from distributing meat after samples taken from it tested positive for listeria‚ the Gauteng health department confirmed on Saturday. Investigators were led to the abattoir after a food sample from a patient who was confirmed to have listeriosis tested positive for the pathogen. 5.7 Earthquake hits the southern east Pacific rise. 5.4 Earthquake hits the Nicobar Islands off India. 5.2 Earthquake hits Kepulauaan Mentawai, Indonesia. Western Australia – Low-lying areas of Waitsburg along the Touchet River were flooded Friday as the river swelled due to a steady rain melting snow in the Blue Mountains. The National Weather Service issued a flood watch for the Waitsburg area Friday afternoon with the river running above its banks as it flowed through the town. Philippines – Floods continue in Bicol with thousands inundated by 1.5 m floodwaters in three barangays in Lupi town, where a spillway overflowed, forcing villagers to use boats to get around. Zambian President Edgar Lungu has directed the military to help fight the spread of cholera, which has killed 41 people in the nation’s capital and made more than 1,500 others sick since late September. 5.7 Earthquake hits Kepulauan Talaud, Indonesia. 5.1 Earthquake hits offshore Guatemala. Arctic Tsunami – A huge landslide near the western Greenland settlement of Nuugaatsiaq spawned a tsunami on June 17 that killed four people and washed 11 buildings into the sea. The week’s hottest temperature was 127 degrees Fahrenheit (52.8 degrees Celsius) in Death Valley, California. The week’s coldest temperature was minus 111.0 degrees Fahrenheit (minus 79.4 degrees Celsius) at Vostok, Antarctica. One-third of forests aren’t growing back after wildfires. Forests in the American West are having a harder time recovering from wildfires because of climate change, according to new research published in Ecology Letters. Researchers measured the growth of seedlings in 1,500 wildfire-scorched areas in Colorado, Wyoming, Washington, Idaho, and Montana. Across the board, they found “significant decreases” in tree regeneration, a benchmark for forest resilience. In one-third of the sites, researchers found zero seedlings. 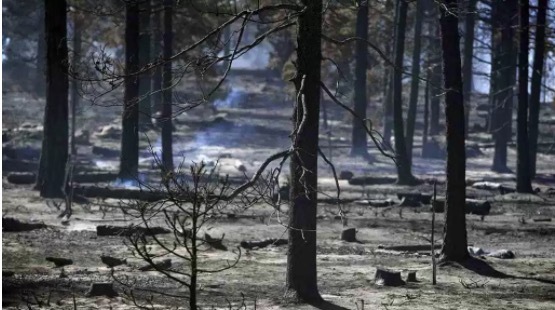 The warmest, driest forests were hit especially hard. Earlier this month, a separate study found that ponderosa pine and pinyon forests in the West are becoming less resilient due to droughts and warmer temperatures. Researchers told the New York Times that as trees disappear, some forests could shift to entirely different ecosystems, like grasslands or shrublands. On 11 December 2017, the National IHR Focal Point of the United Arab Emirates (UAE) reported one additional case of Middle East Respiratory Syndrome (MERS-CoV) infection. One person died while 29 were admitted after an amoebiasis disease outbreak in Tigania West, Meru county. Cases were reported on Tuesday afternoon in Kianjai and Mbeu wards, where residents feared a cholera outbreak but the county health officer reported an outbreak of amoebiasis. Aira | Kyushu (Japan) | 31.593°N, 130.657°E : JMA reported that very small events occurred at Minamidake Crater (at Aira Caldera’s Sakurajima volcano) during 18-25 December. An event at 0514 on 25 December ejected material as far as 500 m from the crater. The Alert Level remained at 3 (on a 5-level scale). Bagana | Bougainville (Papua New Guinea) : Based on analyses of satellite imagery and model data, the Darwin VAAC reported that during 25-26 December ash plumes from Bagana rose to an altitude of 2.4 km (8,000 ft) a.s.l. and drifted NE. Dukono | Halmahera (Indonesia) : Based on analyses of satellite imagery, wind model data, and notices from PVMBG, the Darwin VAAC reported that during 20-25 December ash plumes from Dukono rose to an altitude of 2.1 km (7,000 ft) a.s.l. and drifted NE, E, SE, and S.
Ebeko | Paramushir Island (Russia) : KVERT reported that on 16 December an ash plume from Ebeko was identified in satellite images drifting about 15 km SSW. A thermal anomaly was also visible. Volcanologists in Severo-Kurilsk (Paramushir Island), about 7 km E, observed ash plumes from explosions rising as high as 3.5 km (7,500 ft) a.s.l. during 18-19 and 21-22 December. The Aviation colour Code remained at Orange (the second highest level on a four-colour scale). Karymsky | Eastern Kamchatka (Russia) : KVERT reported that an ash plume from Karymsky was identified in satellite data drifting 114 km ENE on 14 December. No further ash emissions were noted afterwards; the Aviation colour Code was lowered to Yellow (the second lowest level on a four-colour scale) on 24 December. Kilauea | Hawaiian Islands (USA) : During 20-26 December HVO reported that the lava lake continued to rise, fall, and spatter in Kilauea’s Overlook crater. Webcams recorded incandescence from long-active sources within Pu’u ‘O’o Crater and from a small lava pond in a pit on the W side of the crater. Surface lava flows were active above and on the pali, and on the coastal plain. Nevados de Chillan | Chile : On 19 December Servicio Nacional de Geología and Minería (SERNAGEOMIN) Observatorio Volcanológico de Los Andes del Sur (OVDAS) reported an increase in activity at Nevados de Chillán’s Volcán Arrau dome complex during the previous three days. The activity was characterized by minor explosions occurring at a rate of four events per hour. Gas-and-tephra plumes rose 1 km above the crater rim. POVI reported that on 20 December explosions ejected incandescent material above the crater rim. The Alert Level remained at Yellow, the middle level on a three-colour scale, and the public was reminded not to approach the craters within a 3-km radius. Oraefajokull | Iceland : On 22 December IMO reported that activity at Öræfajökull had been fairly stable during the previous weeks, though still above background levels; the Aviation colour Code remained at Yellow. In December the largest earthquake detected was a M2.5, but most events were smaller than M1. Earthquakes were located close to the caldera at depths between 2 and 10 km. Sheveluch | Central Kamchatka (Russia) : KVERT reported that a thermal anomaly over Sheveluch was identified in satellite images during 19-21 December. The Aviation colour Code remained at Orange. Sinabung | Indonesia : Based on observations by PVMBG, satellite images, and model data, the Darwin VAAC reported ash plumes from Sinabung during 20-23 December. The plumes rose 3.7-4.9 km (12,000-16,000 ft) a.s.l. during 20-21 December and drifted E and SW; weather clouds prevented estimates of plume altitudes on the other days. 5.5 Earthquake hits Antofagasta, Chile. In the Southern Hemisphere: Tropical Cyclone (tc) 02s (Hilda), located approximately 94 nm south-southwest of Broome, Australia, is tracking southward at 05 knots.